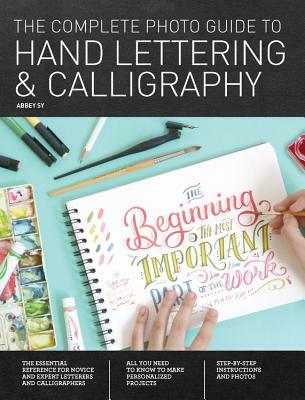 Written by best-selling author and hand letterer Abbey Sy, The Complete Photo Guide to Hand Lettering and Calligraphy covers the basics and beyond for creative lettering techniques. Abbey Sy is an artist and designer whose passion for hand lettering and design is inspired by retro advertising, desaturated hues, and vintage labels. She is the author of Hand Lettering A to Z (Rockport Publishers) and The Complete Photo Guide to Hand Lettering and Calligraphy (CPi). Abbey is also the founder and creative director of ABC Magazine, a publication for artists, crafters, and makers; produces her own merchandise; and teaches art and hand lettering classes. She is based in Manila, Philippines. See more of Abbey’s work on abbey-sy.com, on Instagram and Twitter @abbeysy, on Facebook @artbyabbeysy, and on her YouTube channel Abbey Sy. The Complete Photo Guide to Hand Lettering and Calligraphy is an ideal instructional guide and manual...Thoroughly 'user friendly' in organization and presentation.